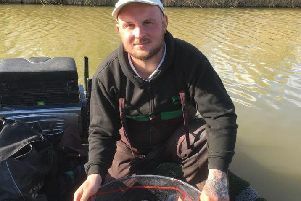 Anglers that enjoy fishing Ferry Meadows at weekends should be aware that just about every peg on both lakes will be taken up for the Ivan Marks Memorial Match on Sunday. Given the size of the match and numbers fishing it would be wise to find other waters to fish as fitting into swims not taken up by match anglers around the lakes could lead to problems during the day. Tuesday Club, Haddon Lodge: 1 Mike Smith 43lb 12oz; 2 Fred Tame 19lb 4oz; 3 Jeff Tuttlebee 18lb 8oz; 4 Jim Inwood 18lb. Fenland Rods, Six Island Pool, Decoy: 1 James Garner 171lb 7oz; 2 Kev Lee 121lb 12oz; 3 Mathew Lutkin 111lb 1oz; 4 Bill Foster 97lb 4oz. Ramsey AS, Day Ticket Lake, Decoy: 1 Harry Young 139lb; 2 Keith Rayment 135lb 8oz; 3 Dave Yardy 120lb 8oz; 4 Vern Edgley 116lb 8oz.